Shine spray for a glossy finish. The perfect blowdry stays looking pristine and has a natural sheen, finish your blow dry with smoothing shine spray, formulated with a generous shine shot, and help protect your style from frizz. ▪ A super dose of conditioners will give hair long lasting smoothness, weightless shine and help protect from frizz. ▪ Also blended with shine-boosting siliconte, this finishing spray has a high refractive index to help conceal the product on the hair and boost shine. 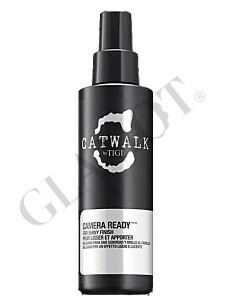 Spray evenly over blow dried hair and brush through, or spray whilst blow drying with cold air.